The framing square is one of the most useful and versatile tools in carpentry. It can be used to layout and cut common rafters, hip rafters, staircase stringers, these few items are only the tip of the iceberg. Many books have been written about the uses of the steel square. On this web page I will discuss the most efficient ways to layout and cut common rafters. Most roof cutters consider their square one of the more important tools they own, calling it a fine tuned instrument. When considering the purchase of a new square, go for quality, those $12 ones just will not cut the mustard under normal everyday use. The square I use is a Stanley stainless steel model, which I have been using for over 15 years, cost 30 some dollars and worth every penny. I will discuss three different methods of laying out common rafters with a square. I know that there are many more ways of accomplishing this task, I have probably used most of them at one time or another. You can ask five different carpenters how to figure and cut rafters and get that many different answers. Whatever works best for you is the method to be used. I like to keep an open mind about carpentry because someone will come along with a better idea. Just to keep it simple I will use the same building dimension in all three examples. The first method is the way I learned nearly thirty years ago called stepping it off, time consuming and tedious but still useful for a small dormer or shed roof. Scenario : You pull up to the job site at 6:40 AM knowing that your first task of the day is to cut the common rafters for a 24' garage. There is only one minor problem, your Construction Master calculator is missing. It's not on the dash, in the glove box, or in your pocket. Where could you have misplaced that darn thing? Worse yet maybe someone decided they needed it worse than you, no time to worry about it now, people will be waiting. You can still get the job done, maybe not as fast as with your Construction Master, however all will be well in the end. Step 1 : Determine the span of the common rafters. Measure the overall width of the building, for this example it shall be 24 feet. Step 2 : Find the run of the common rafter. For a simple gable roof this is half the overall width of the building. In this case to determine the run divide 24' divided by 2 = 12'. Step 3 : Determine pitch of roof. In this example it will be a 6/12.This pitch means there will be 6 inches of rise for every 12 inches of run. Step 4: All actions performed with the framing square should be along the top edge of rafter so place material accordingly. Begin by placing the square at the top edge of rafter with the tongue (skinny part) on 6" and the body (fat part) on 12", draw your plumb cut (where rafter rests against the ridge board) also mark where body section intersects the material. Now move the framing square down the common rafter and line up tongue with previous body mark. Since the run of the rafter is 12' this action will be repeated 12 times. After you have verified repeating this step 12 times mark out another plumb cut line on the 12th body mark. This line represents the outside edge of the building and plumb cut of the birdsmouth. Next, I like to add the tail or overhang of the building. Now mark out your seat or level cut of the birdsmouth. The last step is to take off half the thicknessof the the ridge board, by returning to the top plumb cut and shortening it. If you are using a 1 1/2" thick ridge board this would be 3/4". Synopsis: Determine span, determine run, determine pitch, layout rafter,cut, and test. This method of laying out common rafters is much faster, more accurate, and easier than stepping them off with a framing square. This is the method I used for many years, until the Construction Master calculator came along. The basic steps for laying out the rafter are still the same only you do not have to step off the square a dozen times. Step 3 : Determine length of common rafters per foot run. This can be found on the left side body of the framing square. What you are looking for is a table on the square similar to the one below. This is an abbreviated version of what is actually on the square due to space restrictions on this web page. Since this roof has a 6/12 pitch if you look under the number 6 on the top row you should find the number 13.42". The .42 portion is in fractions of an inch and will need to be converted over to feet and inches later. Step 4 : Determine length of rafter. This step is accomplished by taking the span times the length per foot run. In this example the formula is 12 x 13.42 = 161.04" So the length of our rafter is 161.04 inches. Step 5 : Convert decimal point to fraction of an inch. In this case the .04 inch is of no importance since it is such a minute amount, after all .125 is only 1/8". In the real world you will seldom get this lucky so I will give you an example of how to convert decimal points to fractions of an inch. If you have a decimal point of .625, enter .625 into your calculator and times it by 8 or .625 x 8 = 5 which is 5/8" since you multiplied it by 8. If you multiply by 16 the answer would be in 16's of an inch. Step 6 : Layout rafter. As before begin by placing framing square on top of rafter, tongue on 6", body on 12", and mark your top plumb cut. From the top edge of this mark measure along the top edge of rafter 161 inches (13' 5") and make another pencil mark. Place the framing square on this mark as before and draw another plumb cut line. This line represents the outside of the building, add tail cut as needed. Next step is to mark seat cut for birdsmouth, then shorten top plumb cut by half the thickness of ridge board. Synopsis : Determine span, determine run, determine pitch, determine length, layout rafter, cut, and test. This method is by far the fastest, easiest, and most accurate of these three methods of marking and cutting common rafters. Anyone who does this kind of carpentry work really should learn how to use a Construction Master calculator. I have been using one for over 15 years and wonder how I ever got along without it. If you read the beginning of this page you found the reference to someone else needing it worse than me. My Carhart jacket was stolen from the local watering hole and my calculator was in the pocket. Maybe I should have left before the third beer, we all know how that goes. Anyway the steps are to follow. Step 1 : Determine overall span of rafters. Step 2 : Determine run of rafters. Step 3 : Determine length of rafter. Step 4 : Layout rafter. All four of these steps are much easier with a construction calculator. All you really need to know is the span and pitch to cut the common rafters. After just a few times of doing it this way you should be comfortable with the calculator. Armed with the information of 12' span and 6/12 pitch, here is how I would go about figuring the length of the common rafter. Using a Construction Master calculator I would enter 24' minus 1" 1/2 divided by 2= run 11'11" 1/4 then 6" pitch then diag. 13'4" 3/16. So the length of the common rafter from the outside wall to the ridge board is 13'4" 3/16, however there is so much more information available just from entering the run and pitch factors. Here are a few of the numbers the calculator stores just from these two pieces of information. Run 11'11" 1/4, Diag. (Common Rafter)13'4" 3/16, Rise 5'11" 5/8, Hip or Valley Rafter 17'10" 7/8, Jack 1 11'10" 1/4, Jack 2 10'4" 3/8, and it gives you the jack rafters all the way down until 0 is reached no matter how many there are. You still have to use the framing square to lay out the rafter cuts, however there is no need to shorten it up for the ridge board since I took it out in the very beginning. There is no other tool available today that holds the answers to common roof framing problems than the framing square. It would be useless for me to go on and on about the many virtues of the steel square. I will only talk to you about the little numbers on the framing square that you will need for conventional roof framing. Many of the solutions and numbers are outdated and seldom used by modern carpenters. There are two main parts to the square, the body and the tongue. The body is the 2" wide 2' long blade on the square. The body is normally used to mark the level or horizontal cuts on the rafter. The tongue is the 1" 1/2 wide 16" long blade that is normally used to mark the plumb or vertical cuts on rafters. The body and tongue intersect at the heel on the outside edge of the square. There is also front and back to the square which I could write a whole chapter and probably only confuse you and myself. For this reason I have included two images to better explain the front and back. The most important set of numbers on the framing square are the rafter tables. These are located on the face side of the body. The first four rows of numbers are the most important and the only ones I will cover here. 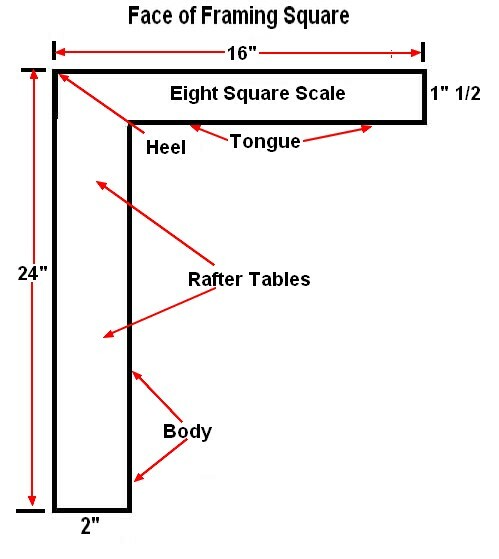 Length of common rafters per foot run. This row represents how long a common rafter is per foot of run. To find the number needed look under the number of the pitch of the roof you are working on. For example if you look under the 6" mark on the outside edge of the body you should find 13.42. If you look under the 9" mark = 15. Length of hip or valley per foot run. This row represents the length of a hip or valley rafter per foot run. As before if you look under the number 6" you should find 18, or the number 9" = 19.21. Difference in length of jacks at 16" and 24" centers. There is actually one row each for 16 and 24" centers. These two rows represent how much longer or shorter the next jack rafter is than the previous one. In other words if you need one longer, add the number from the column to get the next one. If you are working your way downhill subtract the number. As before if you look under the 6" mark for 16" centers you should find 17" 7/8. Under 6" mark for 24" centers = 26" 13/16. You might find the brace measurement tool handy if you build decks or need a permanent, good looking brace for any reason. If you look closely at the tongue on the back side of the framing square you will see two small numbers stacked one on top of the other with a larger single number just to the right of this smaller set of numbers. The first set of numbers is 24 stacked on each other followed closely by the number 33.94 inches. In other words if you need a brace for a porch or deck set at a 45 degree angle, measure 2 feet away from the post and 2 feet down the post and the length of your brace should be 33.94 inches. Always use outside edge of framing square when possible to avoid confusion. Get a good framing square, the Wal-Mart cheapie will not do the job. Use stair buttons to speed up the framing square step off method and reduce the chance of mistakes. Use the two foot step off technique if possible. To accomplish this task, just double all measurements on the framing square. For a 6/12 pitch hold the tongue on 12 inches and the body on 24 inches.